Thirty-seven of PBI UMY students attended a special closing of reading date of batch 2 on 7th July 2018 at Kelas Pagi Yogyakarta. The event was to appreciate the students whojoined the reading date program. In this event, a guest star that could inspire students to improve their reading interest was invited. Starting at 3.30 p.m., the event was divided into 4 sections; there were opening, Q&A session, winner announcements and closing. Dafa Dewa Saputra, as a guest star from Gajah Mada University, shared his story in becoming a fluent userof English. Dafa managed to get 653 score on his TOEFL and answered perfectly in reading section. He gave his tricks to increase the reading interest of students and the benefits that would be gained from reading. The second event was students asked questions to Dafa and he also asked questions to students. Students who had the most memorable question and answer would be rewarded. The third event was distribution of prizes to the best group, the most disciplined group, the most inspiring member, and the best question and answer. 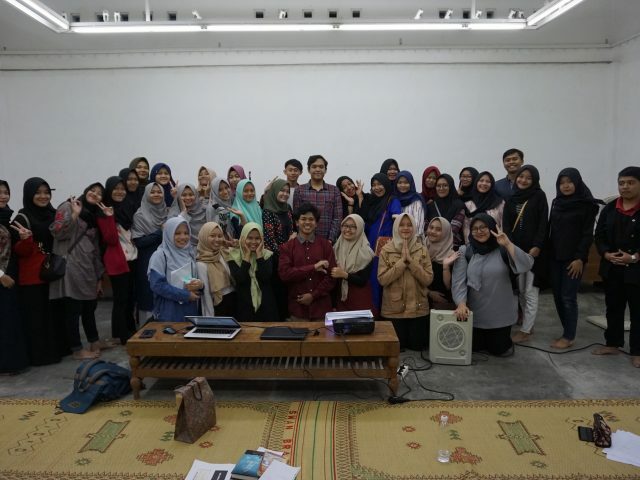 One of the students, Sri Indriani, said that many positive things were obtained from this program but as a group leader it was quite difficult to determine the time to gather with their members. However, she admitted that she gets more accustomed to reading more because of the program. Evi Pusputasari, M.Hum, the initiat0r and coordinator of the program, hoped that students would continue to read even though the program has stopped.